On Wednesday, three goats munched on the plants along the small city’s bike path behind the high school and near a river. 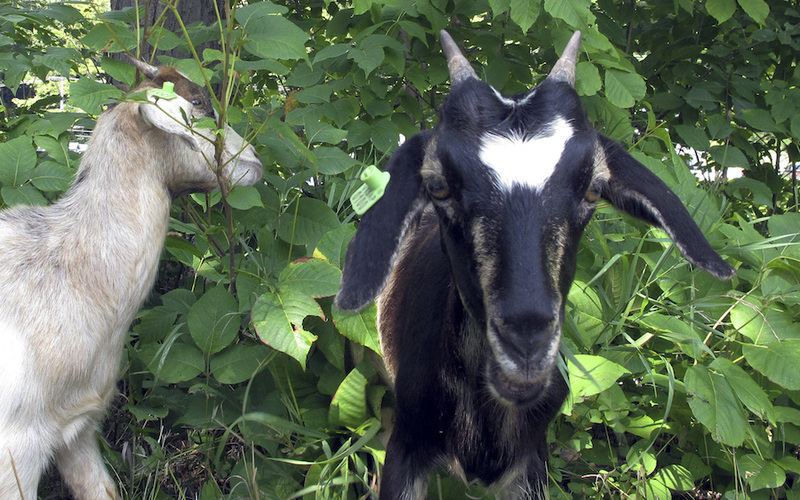 The goats graze on the poison ivy, causing stress to the plants so that they retreat, said the goat’s owner Mary Beth Herbert, of Moretown. It’s expected to take several years of cyclical grazing to eradicate the poison ivy, she said. The goats named Ruth, Bader and Ginsburg, got their start. Herbert brought the 6-month-old Kiko goats in her Subaru, and enclosed them in fencing where they grazed while an occasional bicyclist passed by. The poison ivy doesn’t harm the goats, she said. The city had tried to eradicate the poison ivy but has been unable to do it using organic treatments, said assistant city manager Susan Allen. The poison ivy has been so bad this year that the city posted signs warning bikers and walkers about it. “The city did not want to ramp up to chemical treatments for many reasons, including the fact that the path runs next to the river, and young children and dogs might get over into the undergrowth,” she said. They wondered if goats could work and contacted the University of Vermont extension service. “I love that we’ve gone back to an old fashioned solution — a shepherd and her goats — to our modern-day problem,” Allen said.